How and when did Freemasonry start. If you have ever wondered about the history of Freemasonry and how it began. How it gradually progressed and evolved into what we know it is today, the following may give you some insight into its early beginning, the start of modern Freemasonry and how it is still developing, please read on. There are two main theories for the origin of Freemasonry. 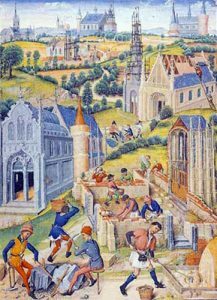 According to one, the history of Freemasonry began with the operative stonemasons who built the great cathedrals and castles had lodges in which they discussed trade affairs. They had simple initiation ceremonies and, as there were no City and Guilds certificates, dues cards or trade union membership cards, they adopted secret signs and words to demonstrate that they were trained masons when they moved from site to site. In the 1600’s, these operative Lodges began to accept non-operatives as “gentlemen masons”. Gradually these non-operatives took over the Lodges and turned them from operative to “free and accepted” or “speculative” Lodges. The other theory is that in the late 1500’s and early 1600’s, there was a group which was interested in the promotion of religious and political tolerance in an age of great intolerance when differences of opinion on matters of religion and politics were to lead to a bloody civil war. In forming Freemasonry, they were trying to make better men and build a better world. As the means of teaching in those days was by allegory and symbolism, they took the idea of building as the central allegory on which to form their system. The main source of allegory was the Bible, the contents of which were known to everyone even if they could not read, and the only building described in detail in the Bible was King Solomon’s Temple, which came the basis of the ritual. The old trade guilds provided them with their basis administration of a Master, Wardens, Treasurer and Secretary, and the operative mason’s tools provided them with a wealth of symbols which to illustrate the moral teachings of Freemasonry. Any of the characters mentioned in the books of Bible (Kings and Chronicles) are seen in the context of the degrees of Masonry. They include King Solomon himself and Hiram King of Tyre, who supplied many of the materials for the temple (especially the Cedar wood used to construct that temple). Also mentioned is Adoniram and many others that history does not make note of today. Although some Masonic brothers may take the rituals to be historical truth, there are no true Masonic authorities who give and credence to an actual organisation of Masons in ancient times. It is not known when the modern form of Freemasonry began. The earliest recorded “making” of a Freemason in England was found in the early 1600’s with references to Freemasonry in personal diaries and journals. 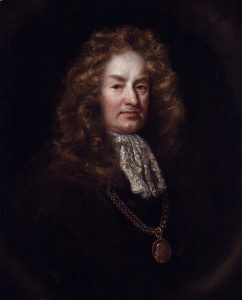 Elias Ashmole (1617-1692) was made a Mason in 1646 and notes attending several Masonic meetings. There appears to be a general spread of the Craft, between Ashmole’s account and 1717, when organised Freemasonry began with the founding of the Grand Lodge of England on St John’s Day 24 June 1717 in London, when Four “old lodges” came together together at the Goose and Gridiron Ale House and organized the first Grand Lodge in the world and originally known as the Grand Lodge of London.Ireland followed in 1725 and Scotland in 1736. All the regular Grand Lodges in the world trace themselves back to one or more of the Grand Lodges in the British Isles. With the foundation of this first Grand Lodge, Freemasonry shifted from being an obscure, relatively private, institution into the public eye. The years following saw new Grand Lodges open throughout Europe. How much of this growth was the spreading of Freemasonry itself, and how much was due to the public organization of pre-existing private Lodges, is uncertain. 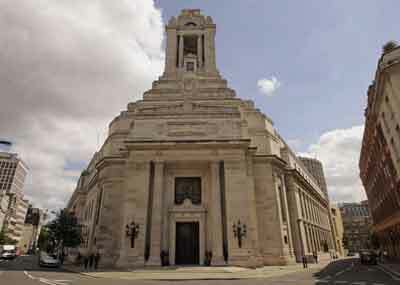 The first Grand Lodge in England was soon challenged by a rival organization. Some have termed this a schism (a split), but other recent scholarship claims that the rival Grand Lodge originated from Lodges in other parts of the British Isles, notably Ireland. The new organization sought to attract members by claiming greater authenticity using the term “Antient” as part of their name. The Antient (or Ancient) Masons were also known as “Athol” Masons, from the Duke of Athol being one of their early Grand Masters (Presidents). Eventually those two Lodges merged into one organization, the United Grand Lodge of England, in 1813. By this time both lodges had been chartering lodges in the New World. Some are known as “Ancient Free and Accepted Masons” or merely “Free and accepted Masons.” It seems that the only difference is that the Ancient ritual is considerably briefer than the Modern version. The Premier Grand Lodge of England and the Antient Grand Lodge of England were amalgamated into the United Grand Lodge of England (UGLE) on 27 December 1813 (day of Saint John the Evangelist), by twenty-one articles of “The Articles of Union” – specifying the agreements made regarding the various points of contention. A special lodge, The Lodge of Promulgation, was established by the Moderns in 1809 to promulgate the ancient landmarks of the Order, as well as instructing and negotiating with the members of the two factions to include the discontinuation of any innovations or changes introduced by the Moderns. The Union largely confirmed the Ancients’ forms and ceremonies, and therefore considerably revised the Moderns’ rituals. One of the most important changes was the reference in Article Two to the Royal Arch Degree as included in the, third, Master Masons’ Degree – a practice that had always been peculiar to the Ancients lodges.. Following the union in 1813, a Lodge of Reconciliation (1813-1816) was established to complete the rationalisation of the ritual into a form acceptable to both parties forming the newly constituted United Grand Lodge. In 1823 a Emulation Lodge of Improvement was established. Upon the union of Antients and Moderns, the UGLE also created a new Constitution, based on the Constitution of Anderson of the Moderns and the Ahiman Rezon of the Antients. Both the Ancients and the Moderns had daughter Lodges throughout the world, and because many of those Lodges still exist, there is a great deal of variety in the ritual used today, even between UGLE-recognized jurisdictions in amity. Most Private Lodges conduct themselves in accordance with a single Rite. A great schism or split in Freemasonry occurred, between the English (UGLE) and French (GOdF), in the years following 1877, when the Grand Orient de France (GOdF) started unreservedly accepting atheists, and recognized Women’s Masonry and Co-Masonry. Also French Masons tended to be more willing to discuss religion and politics in their Lodges; unlike the English who banned such discussions outright.The schism between the two branches was occasionally, (unofficially or partially) breached, especially during the First World War when American Masons overseas wished to visit French Lodges. As to religious requirements, the oldest constitution found in Freemasonry — Anderson’s Constitutions of the Free-Masons, 1723 — says that a Mason “will never be a stupid Atheist nor an irreligious Libertine” if he “rightly understands the Art”. The only religious requirement was “that Religion in which all Men agree, leaving their particular Opinions to themselves”. Masons debate as to whether “stupid” and “irreligious” are meant as necessary, or as accidental, modifiers of “atheist” and “libertine”. It is possible the ambiguity is intentional. In 1849, France (GOdF) followed the English (UGLE) lead by adopting the “Supreme Being” requirement, but pressure from Latin countries produced by 1875, the alternative phrase “Creative Principle”. This was ultimately not enough for the GOdF, and in 1877 it re-adopted the original Anderson document of 1723. They also created an alternative ritual that made no direct reference to any deity, with the attribute of the Great Architect of the Universe. This new Rite did not replace the older ones, but was added as an alternative, as Continental European jurisdictions, generally, tend not to restrict themselves to a single Rite — offering a menu of Rites, from which their lodges may choose. 1717 Grand Lodge convened. Anthony Sayer becomes Grand Master. ‘First Assembly’ of the Grand Lodge, 24th June.1723 Book of Constitutions published. Secretary to Grand Lodge first appointed. 1729 Grand Stewards first appointed. 1730 Duke of Norfolk, Grand Master, presented sword of Gustavus Adolphus to Grand Lodge. 1751 Atholl or Ancient Grand Lodge formed. 1765 HRH Prince Edward Augustus, Duke of York and Albany, initiated, 27th July. 1766 HRH Prince William Henry, 1st Duke of Gloucester and Edinburgh, initiated, passed and raised, 16th February. 1767 HRH Prince Henry Frederick, Duke of Cumberland and Strathearn, initiated, passed and raised, 16th February. Charter of Compact under which the Grand Chapter was constituted, signed 22nd July. 1771 3rd Duke of Atholl installed Grand Master, Antient Grand Lodge. 1773 Freemasons’ Hall, Great Queen Street, London committee appointed. 1775 Freemasons’ Hall foundation stone laid. 1782 HRH Duke of Cumberland and Strathearn elected Grand Master. 1786 HRH Prince William Henry (later King William IV) initiated 9 March. 1787 HRH George, Prince of Wales (afterwards Prince Regent and George IV) initiated, 6th February. 1788 Royal Masonic Institution for Girls founded. 1791 HRH Prince George, Prince of Wales (later Prince Regent and George IV), installed as Grand Master, May. 1796 HRH Prince Ernest Augustus (later Duke of Cumberland and Teviotdale and King Ernest I of Hanover), initiated 11th May. 1798 HRH Prince Augustus Frederick (afterwards Duke of Sussex), initiated 20 December. Royal Masonic Institution for Boys founded. 1813 HRH Duke of Kent elected Grand Master. HRH Prince Edward, Duke of Kent and Strathearn, elected Grand Master of the Atholl or Antients Grand Lodge. Both Grand Masters signed the Articles of Union on 25 November, subsequently ratified by each constitution on 1st December. Both signed the Warrant of the Lodge of Reconciliation on 7th December. HRH Duke of Sussex elected Grand Master of the United Grand Lodge of England, 27th December. 1814 HRH Duke of Sussex installed as Grand Master of the United Grand Lodge of England, 2nd May. 1815 Constitutions of the United Grand Lodge published. 1817 Union of the Grand Chapter with Antient Royal Arch Masons, 18th March. 1830 Charity Jewel instituted. William IV became Grand Patron. 1843 Duke of Sussex died. Fund in his memory started in his memory and devoted to the Royal Free Hospital, Gray’s Inn Road, London. 1852 Queen Victoria became patroness of the Masonic Boys’ School. 1868 HRH Albert Edward, Prince of Wales (later Edward VII), initiated in Sweden, 21st December. 1874 HRH Albert Edward, Prince of Wales (later Edward VII), elected Grand Master. 1875 HRH the Prince of Wales installed at the Royal Albert Hall as Grand Master, 28 April. 1880 Foundation stone of Truro Cathedral laid by the Prince of Wales, Grand Master. 1882 Queen Victoria became Chief Patroness of the Masonic Girls’ School. 1885 HRH Prince Albert Victor (later Duke of Clarence and Avondale), initiated 21st March. 1910 George V became Grand Patron of the three Masonic institutions. Queen Mary became Grand Patroness and Queen Alexandra Chief Patroness of the Royal Masonic Institution for Girls. 1917 Bi-centenary of the United Grand Lodge of England. 1919 HRH Edward, Prince of Wales (later Edward VIII and then Duke of Windsor), initiated 2nd May. HRH Prince Albert, (later Duke of York and George VI), Initiated, 21st December. Appeal for a Masonic Peace Memorial and subsequent Establishment of the Masonic Million Memorial Fund. 1921 Hall Stone Lodge Medals first conferred, 7 December. 1927 Foundation stone of Peace Memorial Building at Great Queen Street laid (by electrical connection) in the Royal Albert Hall. 1928 HRH Prince George (later Duke of Kent), initiated 12 April. 1933 George V, accompanied by Queen Mary, opened the new Freemasons’ Hospital and Nursing Home, later named, by Royal authority, the Royal Masonic Hospital. 1934 Visit to the Masonic Peace Memorial by George V and Queen Mary. 1937 George VI invested as Past Grand Master at the Royal Albert Hall. 1939 HRH Duke of Kent installed as Grand Master by George VI, at Olympia, 19th July. 1942 HRH Duke of Kent killed on active service, 25th August. 1943 Earl of Harewood installed as Grand Master by George VI, at Freemasons’ Hall, London. 1953 HRH Duke of Edinburgh initiated, 5th December. 1963 HRH Duke of Kent initiated, 16th December. 1966 Bi-Centenary of Supreme Grand Chapter. 1967 HRH Duke of Kent elected Grand Master. 250th anniversary of United Grand Lodge of England. Trust fund set up for surgical research under the direction of the Royal College of Surgeons. 1974 HRH Prince Michael of Kent initiated, 13th March. 1975 Masonic Housing Association registered as an exempt charity. 1986 Physical penalties removed from Obligations, 11th June. 1990 New Masonic Samaritan Fund established. 1992 275th anniversary of Grand Lodge held at Earls Court.